A novel model-based steganographic technique for JPEG images is proposed where the model, derived from heuristic assumptions about the shape of the DCT frequency histograms, is dependent on a stegokey. The secret message is embedded in DCT domain through an accurate selection of the potentially modifiable coefficients, taking into account their visual and statistical relevancy. A novel block measure, named discrepancy, is introduced in order to select suitable areas for embedding. The visual impact of the steganographic technique is evaluated through PSNR measures. State-of-the-art steganalytical test is also performed to offer a comparison with the original model-based techniques. Steganography is the art of hidden communication. Its aim is in fact to hide the presence of communication between two parties. Current steganographic techniques conceal secret messages in innocuous-looking data as images, audio files, and video files. Following the approach in , the actual message to be transmitted is called embedded message, while the innocuous-looking message, in which the other will be enclosed, is the cover message (cover image in case of images). This embedding process creates a new message, called stego message (stego image in case of images), with the same visual and statistical appearance of the cover message but containing the embedded message. Modern steganographic techniques follow Kerckhoffs' principle: the technique used to hide the embedded message is known to the opponent, and the security of the stegosystem lies only in the choice of a hidden information shared between the sender and the receiver, called stegokey . Because of their large diffusion among the Internet, JPEG images are very attractive as cover messages. As a consequence, many steganographic techniques have been designed for JPEG, most of them embedding the message in DCT domain by modifying the least significant bits (LSBs) of the quantized DCT coefficients. One of the first JPEG steganographic techniques following this approach is Jsteg . Outguess  is not only similar to Jsteg, but also preserves DCT global histogram by additional bit-flipping. F5  performs the embedding by decreasing the absolute value of DCT coefficients, thus preserving the DCT histograms peak-shape. Unfortunately, all the techniques are detected with known statistical methods . Model-based steganography (MB)  introduces a different methodology, where the message is embedded in the cover according to a model representing cover message statistics. In , two image steganographic techniques (MB1 and MB2) are illustrated: MB1 models DCT AC histograms by the generalized Cauchy distribution and embeds the message in the cover image through an entropy decoder driven by the model. MB2 also preserves blockiness . In , an ad hoc steganalytical test is developed to detect MB1. The aim of this work is to improve the performance of the mentioned Model-based techniques by considering a better model and a more accurate selection of the modifiable coefficients. The peak-shaped-based (PSB) technique, here illustrated, applies F5 heuristic principles in a Model-based methodology. It is known that both MB1 and MB2 modeling of every DCT AC frequency leaves a fingerprint which allows to detect the presence of the embedded message. In fact, MB1 is detected via a model calculation followed by a goodness-of-fit test . On the other hand, PSB modeling does not characterize strictly DCT AC histograms, but only models in a broad sense the histograms shape. Many cover images already present similar properties, thus making much more difficult the fingerprint discovering. Moreover, PSB model depends on the stegokey: a simple analysis of the stego image is not sufficient to perform an exact model calculation, regardless of the possible attacker. Futhermore, PSB accurately selects the modifiable coefficients by exploiting the quantization matrix and introducing a novel parameter, named discrepancy, measuring how much a given image portion is suitable for embedding the hidden message. This paper is organized as follows. Model-based methodology is introduced in Section 2, together with embedding and extraction algorithms. In Section 3 the PSB technique is described and its superior performance over original Model-based techniques is demonstrated. Conclusions are drawn in Section 4. The steganographic technique introduced in this work, named peak-shaped-based steganography (PSB), is developed following the Model-based steganography principles exposed in Sallee's work  of which for sake of completeness, a brief outline is given in Section 2.1. Next, PSB is illustrated and the embedding and the extraction algorithm are described. Model-based steganography was first introduced in 2003 . The aim of Model-based steganography is in characterizing some statistical properties of the cover message in order to embed the secret message without altering these properties. The outline of Model-based steganography is described in the following. A cover message, represented as a random variable , is split into two parts, , that remain unaltered during the embedding, and , that is modified to carry the embedded message. is selected so as to preserve the relevant characteristics of the cover, whereas can be modified without altering the perceptual and statistical characteristics of the cover message. By modeling the cover message class according to a probability distribution it is possible to calculate the conditioned probability distribution . The embedded message is assumed to be a uniform random stream of bits, which is in fact the same distribution shown by encrypted messages. The embedding outline is shown in Figure 1. The cover message is split into and , then the embedded message is processed by an entropy decoder according to the conditioned probability distribution . The output of the decoder is denoted by and replaces to form together with the stego message . The extraction outline is shown in Figure 2. 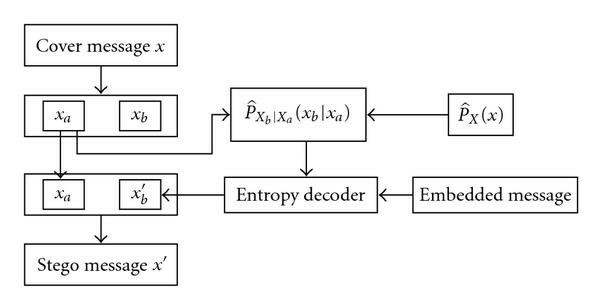 Its structure is very similar to the embedding scheme: the main difference consists in the replacement of the entropy decoder by an entropy encoder. The stego message is separated in and . The conditioned probability distribution is calculated, then the entropy encoder process according to the model distribution. The encoder output is the embedded message. From now on, since the main focus of this work is on hiding information in images, the cover messages will be denoted as cover images. The JPEG compression codes the images by dividing them in blocks, calculating DCT coefficients for every block, and then performing a coefficient quantization. Thus, the quantization makes it impossible to get the original image after the compression. This is an issue for steganography, since hiding the message in the spatial domain should take into account this information loss. Instead, embedding the message in DCT domain permits to avoid this issue. Hence, is selected as a subset of quantized DCT coefficients. The modifiable coefficients are accurately selected in order to preserve the visual and the statistical characteristics of the cover image. The selection consists in three steps: in the first step a preliminary coefficient exclusion is performed, in the second step the maximum number of modifiable coefficients per block is calculated, and then in the final step the modifiable coefficients are selected. DC coefficients are excluded from embedding because of their visual relevance, since they represent the mean luminance value of a block. Zero-valued coefficients are also excluded, since they occur in featureless areas of the image where changes are most likely to create visible artefacts. All the highly quantized DCT frequencies (whose quantization coefficients are greater of a threshold ) are discarded during the embedding because small changes in these coefficients result in large alterations in the respective dequantized coefficients. Moreover, unitary coefficients are also excluded from embedding; experimental results illustrated in Section 3.2.3 show that modifying unitary coefficients increases detectability. The residual coefficient set is denoted by . Moreover, for every block , let denote the number of remaining coefficients in the block. 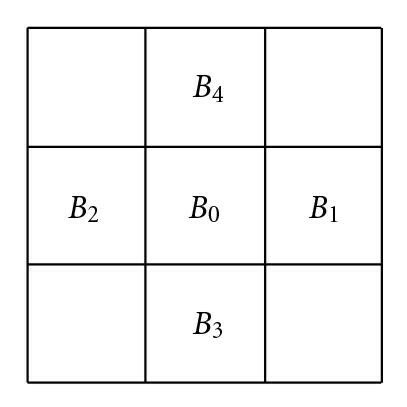 Thus all the groups are disjoint and have two elements which differ only in one unitary value, for example, , and so forth. thus offsets can be only 1 or 2. PSB embeds the message by changing modifiable coefficient offsets, thus only unitary increments/decrements are possible, for example, a coefficient whose value is , after embedding could be only 2 or 3 (its group is ). Offsets are modified according to the model. Some areas of the image could not be suitable to embed the message (e.g., a periodic texture, a sharp area, and so forth where changes could be more detectable), but a first-order statistic modeling is not able to discriminate such areas. A new measure is introduced, named discrepancy, to derive the embedding suitability of an area. The discrepancy is calculated at block layer and expresses how much a block is similar to adjacent blocks. In PSB, discrepancy is used to determine the maximum number of modifiable coefficients within a block. where is th quantized DCT coefficient of th block. Since the embedding modifies the exact -distances from the blocks, and the sender, and the receiver must calculate the same discrepancy in order to extract the embedded message, discrepancy is not calculated as the exact mean, thus the approximation (3) is required. If the block is on image border the discrepancy is calculated taking into account only existing blocks. If the coefficients are selected from by a pseudo random noise generator (PRNG) seeded by the stegokey. The offsets of the coefficients belonging to are replaced according to the message and the model described in the next sections. The embedded message is scattered across the image using a PRNG seeded by the stegokey that permutes the order of the modifiable coefficients. As reported in , it represents a good solution to spread the embedded message in the whole image, both in spatial and in DCT domains. The peak-shaped model is a first-order model characterizing DCT frequency histograms. The model is dependent on the stegokey and therefore an attacker is not able to calculate it exactly. being the histogram of a fixed DCT AC frequency and a positive DCT coefficient. Similar properties apply on negative coefficients. For sake of simplicity the model is described only for positive coefficients on a fixed DCT AC frequency, but equivalent steps hold also from negative coefficients and all the DCT AC frequencies. Finally, is calculated recursively starting with the largest group following the algorithm illustrated by the flow chart in Figure 4. For , since large coefficients are not statistically relevant . 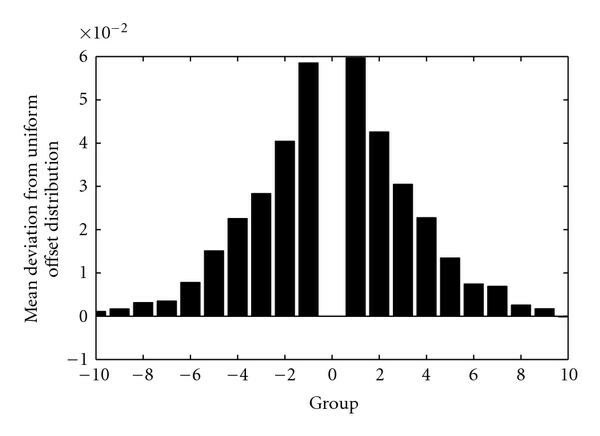 Moreover, Figure 5 shows the deviation of the offset distribution per group from a uniform offset distribution at the DCT frequency averaged on an image database: groups with show a little deviation from the uniform distribution. In addition, it maximizes the embedding capacity for these groups. For if or then . If (13) is not satisfied, the inferior limit expressed by (11) is assumed to be 0. is derived by a PRNG (pseudo random noise generator) seeded by the stegokey according to (11) and (12). Offset deviation from uniform distribution at the DCT frequency (0, 1). A summary of the embedding and the extraction algorithm is illustrated in the following. the modifiable coefficient offsets are replaced by the output of the arithmetic decoder. the header is inspected so as to read the message length and to extract the message. Embedding capacity is defined as the maximum mean message length which could be embedded in an image. To test the validity of this technique, PSB is compared to the original Model-based steganography (MB1 and MB2, described in ). Two experiments are performed: in the first experiment the visual degradation in the image introduced by the steganography is evaluated by calculating PSNR; in the second experiment the state-of-the-art steganalytical test  is performed to compare the robustness of the techniques. These test are carried out on an image database that contains 2000 images taken from BOWS-2 database . All the images are natively in lossless format and gray-scaled. Image dimensions are pixels. The images are converted in JPEG format with a fixed quality factor equal to 80. This experiment is performed by embedding the same message for the three techniques and then evaluating PSNR. The message length is different among the images and equals to the PSB embedding capacity, which is the smallest among the techniques, because of PSB unitary coefficients exclusion. PSNR results are shown in Table 1: PSB achieves slightly higher PSNR with respect to MB1 and MB2 (0.5 dB higher); moreover PSNR is adequate to ignore the visual degradation introduced by the three techniques. The degradation introduced by MB2 blockiness compensation is negligible. PSB detectability is compared to MB1 and MB2 by means of the state-of-the-art steganalytical test . the SVM parameters and are estimated by a five-fold cross-validation. where and are the probability of false alarm and missed detection, respectively. The aim of a steganographic technique is in achieving a high error probability. Figure 6 shows test results: it is noticeable that PSB outperforms MB1 and MB2 at every bpac. Indeed, PSB error probability is about 0.13 higher than MB1 error probability. At 0.05 bpac PSB achieves about 0.35 error probability whereas MB1 and MB2 error probabilities are about 0.22. 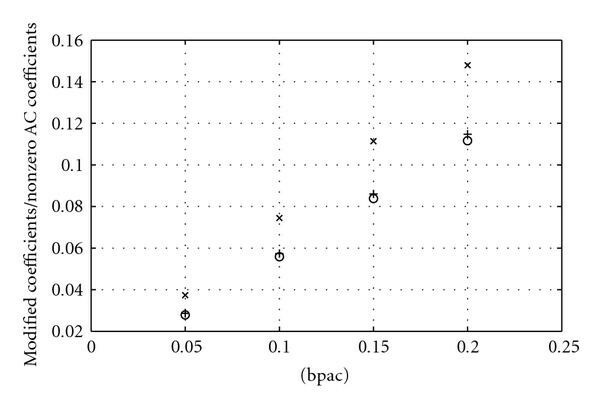 At higher bpac, all the techniques get lower error probabilities: at 0.2 bpac MB1 and MB2 are always detected, in fact the both get 0.008 error probability, instead of PSB error probability which is near 0.07. Experimental results at various bpac (circle: MB1, cross: MB2, plus: PSB). Figure 7 shows the embedding impact as the mean (among the images) of the ratio between the number of modified coefficients and the total number of nonzero AC coefficients. PSB replaces a few more coefficients than MB1 but it gets lower visual degradation and larger error probability. Moreover MB2 has the major embedding impact on AC coefficients due to the addictional changes to preserve blockiness. The embedding impact on AC coefficients (circle: MB1, cross: MB2, plus: PSB). By comparing the embedding impact to the error probability and PSNR it results that the embedding impact has a minor relevance with respect to the selection of the modifiable coefficients. In fact, PSB outperforms MB1 in error probability and gets similar PSNR with a larger embedding impact. These superior performances are achieved by taking into account discrepancy and quantization matrix in order to select the modifiable coefficients set. MB2 modifies additional coefficients to preserve a superior-order statistical measure, but the additional coefficients to be replaced are not selected carefully, getting the worst performances. Since unitary coefficients are the most common coefficient values except for 0, their exclusion affects embedding capacity, but on the other hand modifying unitary coefficients increases detectability. In fact, Table 2 shows error probability for a modified PSB including unitary coefficient values, denoted by PSB+1 (groups and model are modified to include unitary coefficient values). PSB and MB1 are also included for sake of readability. It can be seen that unitary coefficient values exclusion increases PSB error probability by approximately 0.04 at bpac minor than 0.2, motivating their exclusion. At bpac larger than 0.2 both PSB, MB1 and PSB+1 get a zero error probability, hence it no longer makes sense the embedding. Therefore, the unitary coefficient values impact on embedding capacity is negligible. Comparison between PSB+1 and the other techniques: error probability. Moreover, Table 3 shows the embedding impact of PSB+1 with respect to PSB. Both the techniques achieve the same embedding impact, whereas PSB+1 gets lower error probability. This is a further confirm to the minor relevance of the embedding impact with respect to the selection of suitable coefficients. Comparison between PSB+1 and PSB: modified coefficients/nonzero AC coefficients. Usually JPEG quality factors used in storage are included in the interval that is a good trade-off between quality and file size. Hence in the previous experiments the quality factor is set to 80. Moreover, in  the quality factor is set to 80, whereas in  and in  is set, respectively, to 75 and 70. Although the quality factor choice is arbitrary, the steganographic detectability could be affected by the different quantization, so some experiments are made to test PSB detectability with different quality factor. The results are illustrated in Table 4. PSB outperforms MB1 and MB2 at all the quality factors. Furthermore, PSB error probability, together with MB1 and MB2 error probability, is affected only partially by the quality factor. In fact at 0.05 bpac the error probabilities at the two quality factors differ only in 0.03, whereas at 0.1 bpac the error probabilities are the same. 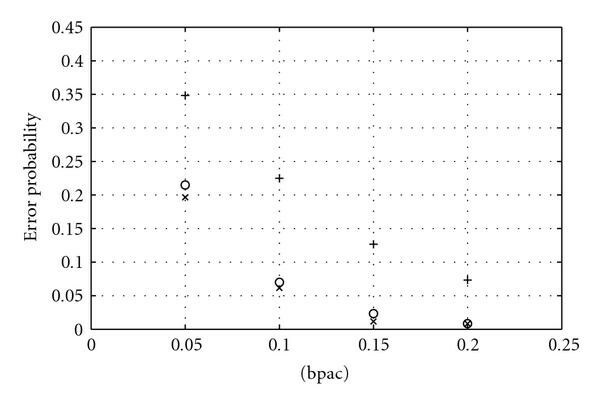 MB1 and MB2 show a larger difference, in particular MB2 error probabilities at 0.05 bpac differ in 0.07. Interesting enough, PSB undetectability improves at the quality factor increase, instead of MB1 and MB2 that show the opposite behavior. Error probability at different quality factors. A new Model-based technique, named peak-shaped-based steganography, is introduced in order to improve the original Model-based steganography. PSB novelty is in a more accurate coefficient selection, taking into account quantization and coefficient relevancy. A novel block measure, named discrepancy, is introduced to describe how much a block is suitable to embed a message. PSB model derives from heuristic hypothesis about histogram shape, moreover the model depends on the stegokey, therefore an attacker cannot calculate exactly the model. The message is scattered in the image by a PRNG seeded by the stegokey. 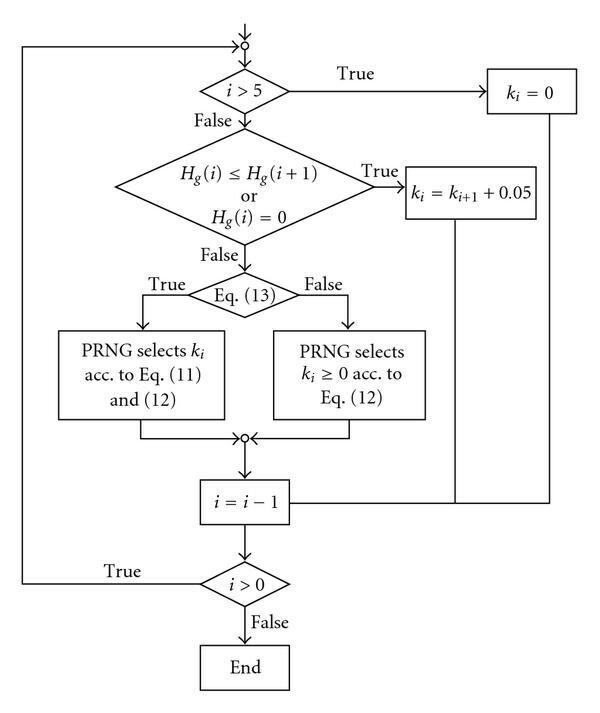 The technique is evaluated by calculating the PSNR on an image database and performing the state-of-the-art steganalytical test described in . In each test PSB outperforms the original Model-based techniques. It is also shown that the embedding impact (how many coefficients are modified during the embedding) results having minor relevance with respect to the selection of the areas in which the message is embedded. Future work on JPEG steganography are directed toward a superior-order modeling of the DCT coefficients, by studying Markov Random Fields and the effect of image noise in DCT domain. In particular, since unitary coefficients modification affects detectability, they are actually excluded from the embedding. However, their exclusion decreases embedding capacity. The authors believe that if a more accurate model is used, unitary coefficients could be included to increase the capacity with no detectability increase. The authors would like to thank Patrick Bas and Teddy Furon for making the BOWS-2 database available.